My page about European satellite broadband service provider companies, has become full so here is a spill over list of additional useful references with emphasis on companies based in the UK providing satellite broadband for England, Wales and Scotland. Home users and small businesses requiring internet access from remote locations should consider satellite communications if high speed terrestrial landline or mobile phone systems do cover your area well. The least expensive VSAT services are shared, where a number of customers share the same high speed download capacity (up to 20 Mbit/s). Dedicated capacity is available for business purposes such as uplinking outside broadcast TV, connection of ATM cash machines, monitoring of remote pipelines, weather stations etc. Avanti-Hylas and ToowayTM; are large Ku band network systems based on multi-spot beam satellites, with customer equipment available via local resellers/installers. There are many other companies able to configure worldwide networks. Think of embassy networks, military, logistics and multi-national businesses with remote offices. Based in Stornoway, CKM Computing cover the Western Isles with a fully equipped mobile unit/vehicle. 20 years of satellite installer experience. 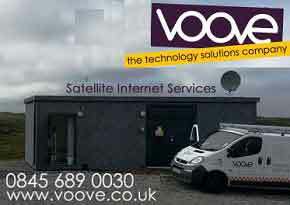 Supply and support for Tooway satellite internet access and TV. Personal service. Based in Kettering, Northants, and covering all of Anglia and the Midlands. They are resellers for Tooway and I have put a picture on the left of a typical Tooway installation they have completed. The company can be reached via support at their web site or on either of the numbers listed below. Established in 1994, this company and the owners have many years of experience in designing earth stations for some of the biggest telecom companies including Inmarsat and BT. 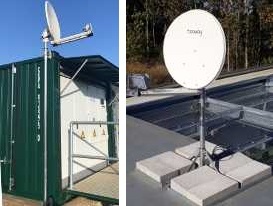 They specialise in providing satellite connectivity for fixed and temporary connections, especially where the requirement is complex or involves company networks. The company is good if you need technologies such as streaming video or audio, WiFi hotspot, high data-rate with low contention. For applications needing low bandwidth (e.g. monitoring and control), they will work out a tariff that reflects the lower resource usage. 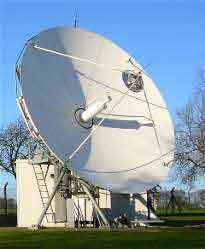 Sales and installation of Tooway and other VSAT systems. Kevin Jones has been in the business since 1989 and is happy to offer helpful advice about how to get broadband speeds in rural areas. Based in Conwy, N Wales. SMS Teleport at Rugby UK. With four large antennas like that shown on the left, plus four smaller antennas, the SMS teleport at Rugby offers satellite communications interconnection from California in the West to Australia in the East - and all points in between. More details http://www.satsig.net/sms-teleport/sms-teleport.htm With an excellent terrestrial Internet backbone, SMS provides a complete satellite communications infrastructure for African service providers on the T11-N and W2a satellites. Service capabilities include VNOs, SCPC, IP connectivity, streaming, voice, video, and data. SMS also offers Hub capacity and terminals for its STMi, iDirect, Tandberg platforms. What really sets Rugby apart and makes its facility unique, is its underground, nuclear bomb shelter which houses the NOC and secure data storage facilities for off-shore data warehousing. Amazing place ! Contact these people if you are thinking of becoming a VSAT service provider and need a teleport facility to host your hub equipment. Email sales@primesatcom.com or Tel. +44 (0)1582 651171 for immediate assistance. Prime Satcom Consulting - a consulting service for the satellite communications community. With over 17 years in satcom systems they bring excellence and experience to your business. They bring resources and capability to fill gaps in satcom programs and sales campaigns, whether you are an equipment manufacturer, service provider or buyer of satcom services. You need these people if you have loads of money and are thinking about getting into some satcom venture but haven't got a clue about link budgets, transponder capacities or whatever. You could save yourself a fortune in wasted investment and may make a small profit with the advice and support provided - which you will have to pay serious money for, so don't ask unless you serious. 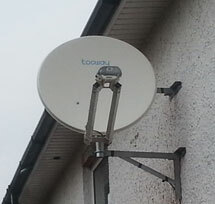 Prime Satellite Broadband helped restore service for those affected when Aramiska ceased operating. Neil Trask is a friend of mine and IEE colleague, in Danbury, Essex and does all kinds of business internet services - mostly of a terrestrial nature. He can work with me if we need more man-power on a UK satellite broadband job. He serves business in London and South East England - Essex, Hertfordshire, Kent, Suffolk, Norfolk, Huntingdon, Bedfordshire &amp; Cambridge. He is a full service provider of quality telecoms solutions for businesses at wholesale prices, including; Mobiles, Landline Services, Fixed and Wireless IT Office Systems, 0800, 0845 and 0870 Numbers, Broadband Internet and Support Services. A wide variety of services and beam coverages. Page created 4 June 2004, amended 15 October 2018, 27 Mar 2019. Images are displayed with permission of the respective companies.